A couple of months ago, Steve Peterson came by the office and showed me an online game created with iThink and isee NetSim called Medici’s Lever. I was really impressed. The game begins in San Jose, California. Dr. Lilia Maria Delgado, a legend of Silicon Valley’s rise to high-tech super power, has died and left a half-billion dollars to establish the “Delgado Arts Endowment”. In her will, Dr. Delgado simply states that the mission of the Endowment is to advance the cultural life of San Jose. Your job is to fulfill the mission by experimenting with the various approaches of five different CEO candidates over a 40 year period. Each candidate personifies a different theory of arts and cultural development and provides you with different investment levers that impact overall “cultural vitality”. The San Jose Rennaissance is one of two educational games that are a part of Medici’s Lever. The other game is very similar but takes place in a different region — this time a fictitious European city dubbed the Capital of Culture. 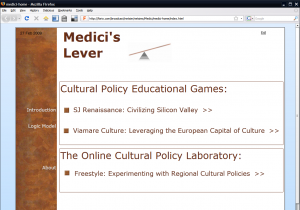 The final module of Medici’s Lever is an interactive Policy Laboratory that lets the user “dial in” initial parameters to define the region in which they want to experiment. Medici’s Lever is powered by an underlying iThink model (although users are unaware of this). The games inform the player that it is driven by a “logic model” they must keep in mind when experimenting. 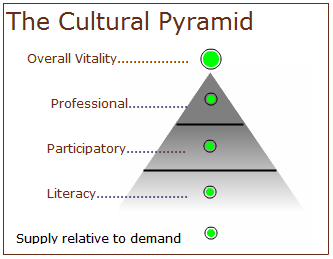 The premise of the logic model is: In order to maintain a healthy cultural ecology a region must strike a balance between three elements — cultural literacy, participation in cultural expression, and consumption of professional cultural goods and services. In the games, the three elements are visualized as a pyramid. What I found out after a couple of runs is that investing in the bottom of the pyramid pays off in the long-term. The insight I gained was that a community needs to have people who appreciate art and culture and actively participate in it from a young age to be successful supporting the professional artists. In other words, it does not make sense to invest in a state-of-the-art performance hall if no one wants to attend the performances. I think Medici’s Lever is an excellent example of how you can get folks thinking about a systemic issue in an easy and engaging way. 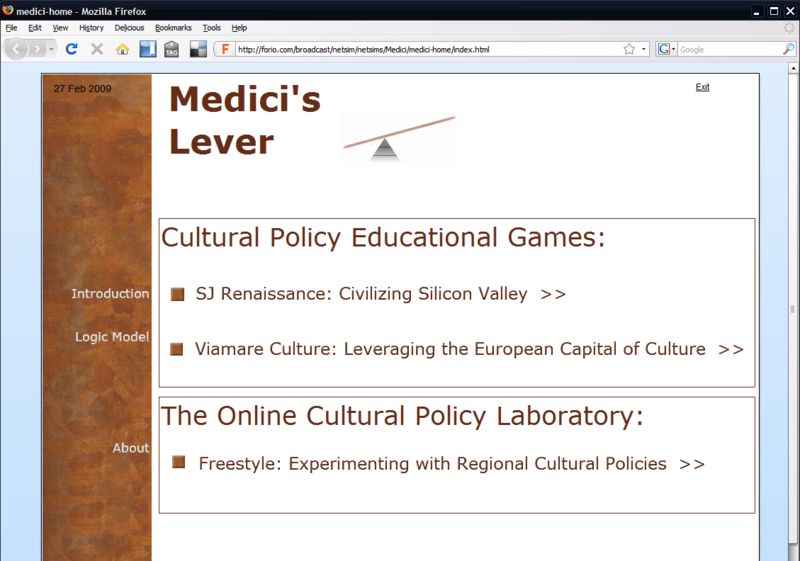 Medici’s Lever is the final project of Cultural Initiatives Silicon Valley, an organization that worked to implement a ten-year cultural plan for Silicon Valley from 1996 to 2006. John Kreidler, Cultural Initiatives’ retired Executive Director, is responsible for the model concept and design. The iThink model and web interfaces were developed by Steve and published online with isee NetSim. It is important to note that at its inception, Cultural Initiatives planned to operate for one decade only. As the end of that decade approached, John and Steve began working on bringing all of the ideas of the foundation together in a model that could be played as a game. It was key that the game live online so others could benefit from the insights of the foundation long after it had sunset. When Steve started developing the iThink model for the game, isee NetSim was in its beta cycle. 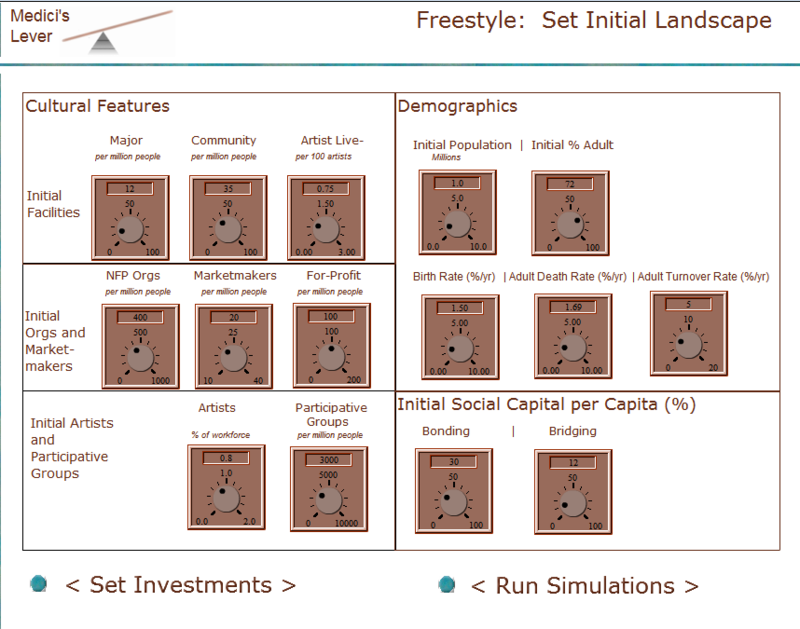 We worked together to see if at this beta stage isee NetSim was up to snuff for creating the type of online game that he envisioned. During the process, Steve gave me a lot of valuable feedback on isee NetSim (and rooted out quite a few bugs too). isee NetSim turned out to be a good fit. Steve has been using iThink for a long time so he knows it well. isee NetSim enabled Steve to do all of the interface design inside iThink itself and let isee NetSim take care of converting it to run over the web. Since the games could now be run in the browser, players would not need to download and install software to play the game. Steve told me that the game is intended for policy makers, community leaders, educators, artists, business leaders — anyone who should be thinking about the role of arts and culture within a community. I asked him how he thought Medici’s Lever would be used. Freestyle allows the user to "dial up" conditions for real metropolitan regions anywhere in the world. This is an interesting point about models in general. This game is fictitious, but the dynamics are useful. By allowing players to dial in different initial parameters (population size, immigration, birth and death rates, social cohesiveness and several cultural factors), users can create conditions for real metropolitan regions anywhere in the world. Another important point is that the model runs over the web. This makes it easy for people who are thinking about these issues to interact with the games and lab and have an informed discussion. Players do not need a background in modeling and system dynamics. And they don’t need to download and install software. If you want to experience Medici’s Lever for yourself, click here to play the game now.